In MODERATE cases it may be necessary to do a third procedure to reestablish the proper position of the front part of the foot. When an implant is placed in the side of the foot the front part of the foot towards the big toe will often elevate, causing a condition called a “forefoot supinatus”. This means that the inner front of the foot is off the ground relative to the heel and outside of the foot. We look at a foot very similar to a “tripod” in which the heel, outer foot and inner foot need to be on the ground at the same level so that it does not tilt. If one of the legs on the “tripod” is off, then the foot begins to tilt and an implant will fail. Failure to understand this is a leading cause of failure of an arthroeresis. This failure is usually due to an inexperienced surgeon and a poor evaluation of the patient. There are four types of procedures that are performed to reestablish a “tripod”. The procedure we most commonly perform is called a “naviculocuneiform joint fusion”. While this is not an unimportant joint, it is not an essential joint as some others and it can be sacrificed to give the arch the stability it needs. 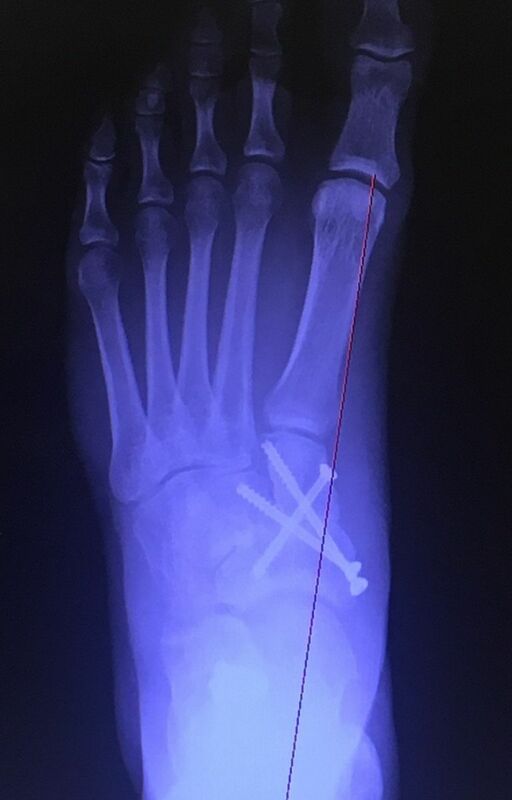 In this procedure we take the cartilage out of two of the midfoot joints and put screws or staples in permanently to fuse the bones together. This procedure reestablishes the “tripod”. This necessitates a similar period of nonweightbearing for 8 or more weeks. Crutches, a Roll-A-Bout walker or a scooter are necessary. Below is X-rays pre and Post NC Fusion with STJ implant, Achilles Lengthening and Calcaneal Osteotomy. The another procedure is called a “Cotton”. In a Cotton procedure the medial cuneiform bone, which is near the height of the arch on the inside of the foot, is cut from the top to almost the bottom. It is opened and a bone graft from 4-8 mm is placed in the area to drop the front part of the foot down to reestablish a “tripod”. This bone graft is from a cadaver and needs to be reincorporated into the foot. A similar period of 8-10 weeks of nonweightbearing may be necessary. During this nonweightbearing process casts are always utilized. A third procedure is called a first tarsal metatarsal joint fusion. 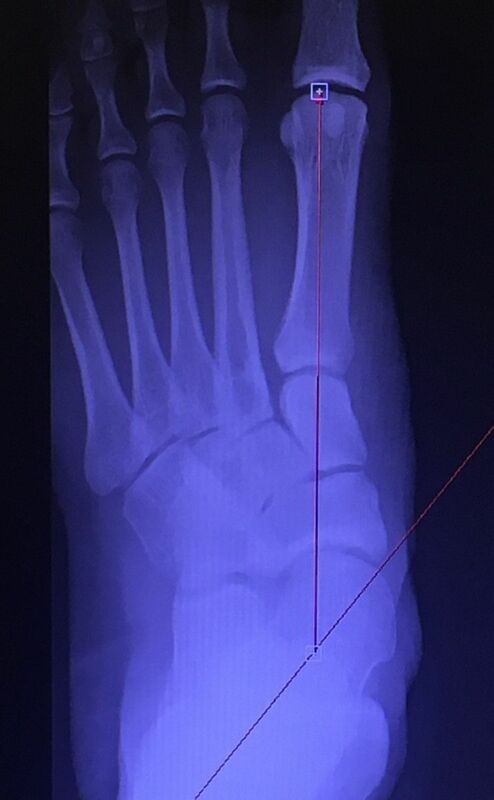 In this procedure the first tarsal metatarsal joint cartilage is removed and small wedges are taken out of the bone after the cartilage has been removed. These wedges can place the first metatarsal in a down position (plantarflexed) to reestablish a tripod. Small screws and/or screws and plate are placed in the joint (first metatarsal and medial cuneiform) to allow a fusion to take place. Postoperatively we usually immobilize the area for eight weeks to allow the fusion to take hold. In some cases the instability in this joint is associated with a bunion deformity. This can be corrected at the same time. The last procedure is called a plantarflexory wedge osteotomy of the first metatarsal. We would do this procedure when there is no instability to the midfoot and we want to get a little bit more of a tripod effect. A small wedge of bone is taken out of the first metatarsal. This wedge has its apex on the top back end of the bone and its base more forward and plantar. When this pie shaped wedge of bone is removed, the first metatarsal is able to drop down so that the tripod is in effect and functional. Small screws are placed in the bone to allow the bone to heal. A period of 6-8 weeks of immobilization is necessary to allow the proper consolidation of the surgically placed fracture. This procedure is not associated with correction of a bunion or midfoot fusion.